on Wednesday, the 27th of March 2019, at 6:30 p.m. The exhibition will be accompanied by a fully illustrated catalogue (84 pages and 66 images, price Euro 10). You also have the possibility to leaf through the cataloque (PDF) virtually here. Please see most of the works from the exhibition here:. 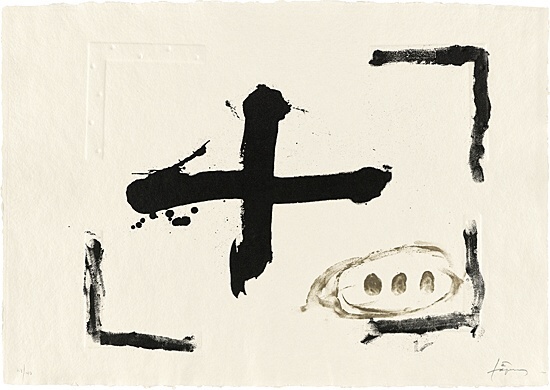 ohne Titel aus "El rei de la màgia"
"Mà i creu sobre gris"
As probably the most important Spanish Informel artist, Antoni Tàpies (Barcelona 19232012 Barcelona) is represented in all international museums with his expressive material pictures. 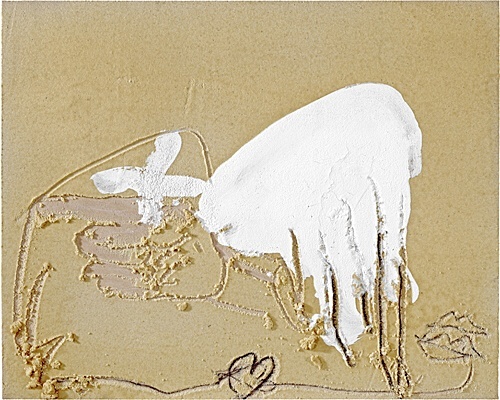 His paintings were created by applying thick layers of paint, which he repeatedly scraped off and re-applied until the surfaces were reminiscent of rough, cracked walls. 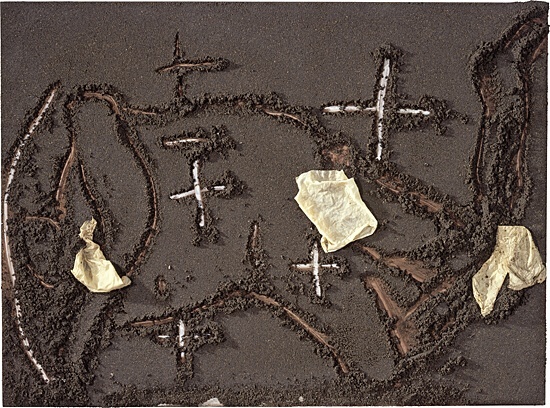 He added sand, cement, marble dust, glue and collages of various materials and found objects, as well as overpaintings reminiscent of graffiti. 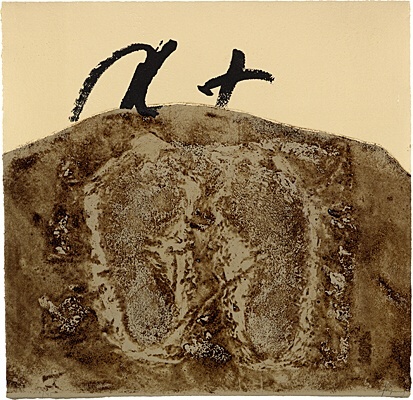 As a brilliant printmaker, Tàpies also mastered all original printmaking techniques and succeeded  like very few of his contemporaries  in captivating the power of his painting in prints as well. 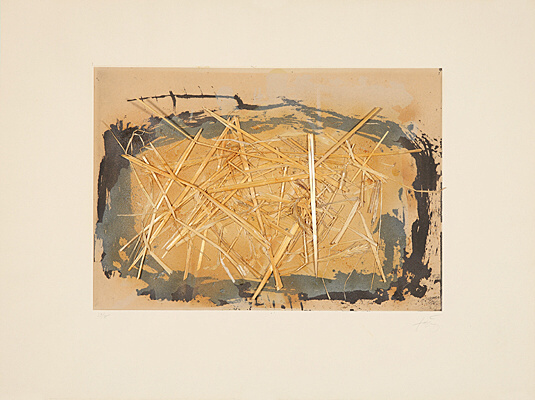 In the field of twentieth-century abstract art, there is hardly an artist who has been able to integrate such a large number of expressive coloured etchings into his artistic work. 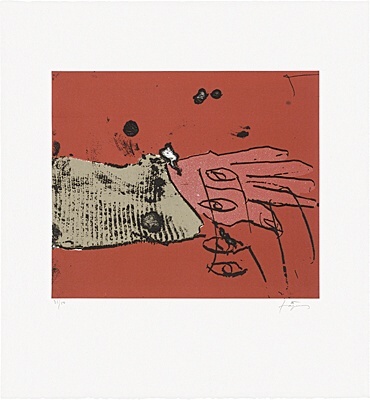 Many of his coloured etchings, some of which are embellished with collages and overpaintings, have a three-dimensional quality that goes far beyond what one is generally accustomed to in printmaking. Experimentation has always been his domain. 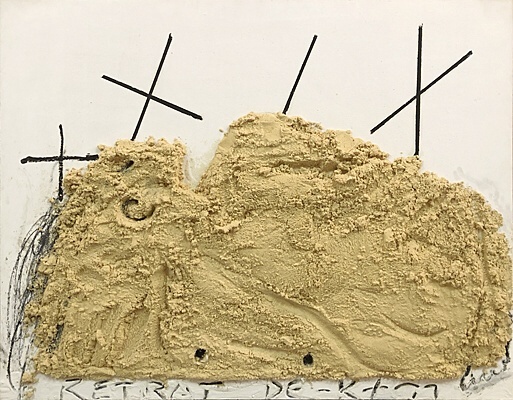 In the late 1950s, his first material pictures emerged from the experimental handling of unusual materials, such as marble powder, sand, varnish, and collages. 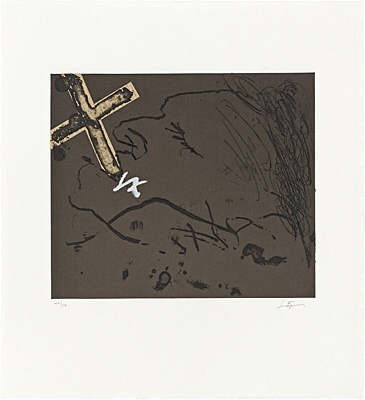 By experimenting with techniques, printing processes and materials, by combining, varying and transforming motifs, substances and surface textures, Antoni Tàpies also developed his prints and revealed within these an unprecedented wealth of ideas. 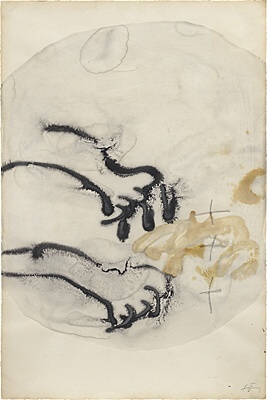 He was fascinated by playing with the possibilities this medium offered him in the combination of various processes and in the range of expression: from the light and playful to the seemingly petrified, from vivid colour in lithography to the total deprivation of colour in embossing, from the poor disposable materials such as scraps of wrapping paper, adhesive tape and old newspaper pages to the imitation of a luxurious-looking dark-red velvet ribbon in the artists book. The spectrum of experimentation and variation seems inexhaustible. 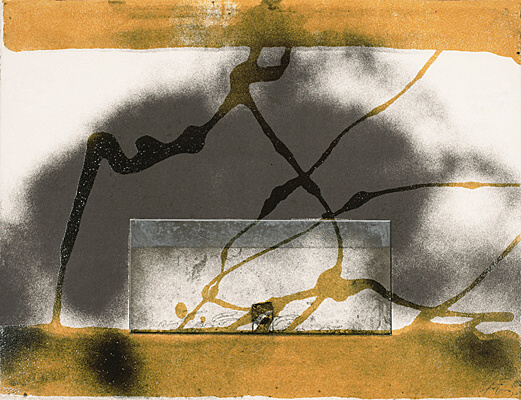 Corresponding with his mixed technique in the material pictures, he also supplements the classical printing techniques  lithography, etching, synthetic resin aquatint, woodcut  with various materials and objects, which he also uses as a printing block: corrugated cardboard, textiles, lead letters, nails, safety pins, everyday objects used in his studio, such as spectacles, scissors, tools, spoons, knives, forks, brushes, rags, even clothes, underwear, socks, shoes or an old slate board. They have been an integral part of his repertoire of motifs for decades. 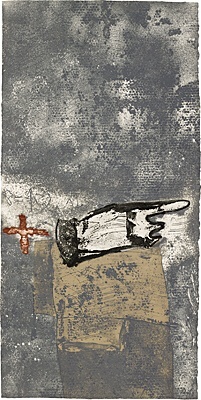 In addition, there are his recurring signs, which occasionally appear as reliefs, collages or traces of painting: the isosceles cross (...), the letters A and T  his initials, which simultaneously stand for Antoni and Teresa  the four red fingerprints associated with the Catalan flag, and finally his footprints and handprints, with which he documented his own aging process. 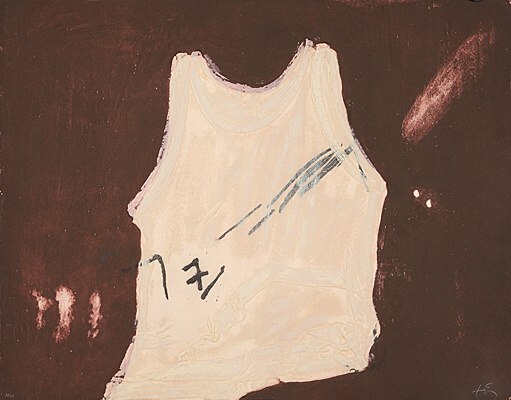 Over the years, Tàpies developed a fixed canon of motifs and materials that recurs in many variations, making his art legible as the legacy of the time in which he lived. Born in Barcelona in 1923, he experienced the Spanish Civil War as a teenager, followed by almost forty years of dictatorship. 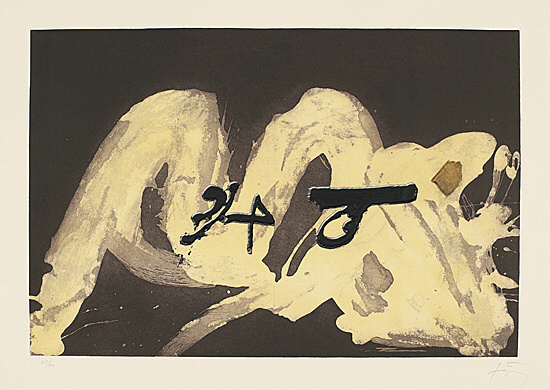 War, destruction, oppression and protest have shaped his art. 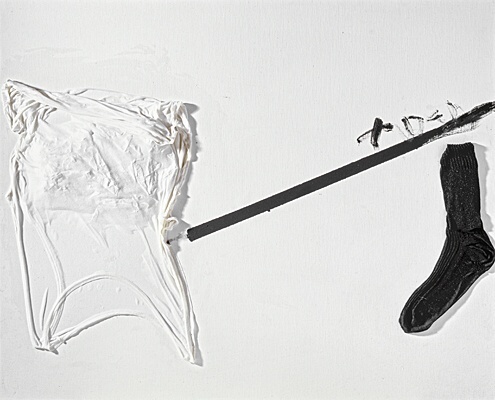 As a contemporary witness, he has carved daily politics, historical events, legends and traditions into it  but also the quotidian, the many objects that came out of fashion and that we so directly associate with Spain: the shopping bags woven from cord, the flat natural fibre brooms with wooden sticks, old iron roller shutters and wooden folding shutters. 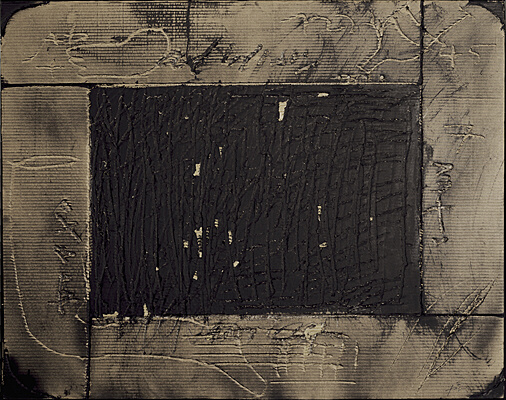 Like the flotsam of the past, Tàpies has incorporated it into its art. 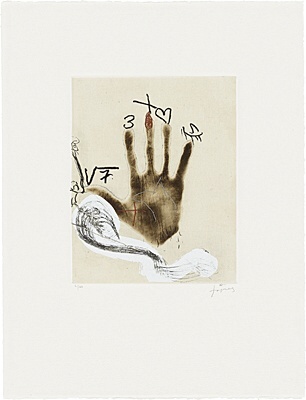 Its traces can also be discovered in his prints. 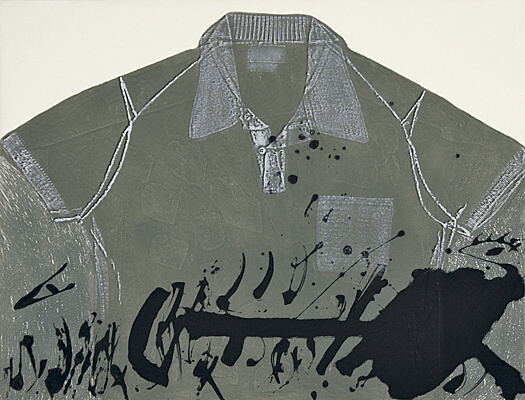 Tàpies created most of his prints in the 1970s and early 80s. These were explosive, political years in Spain. 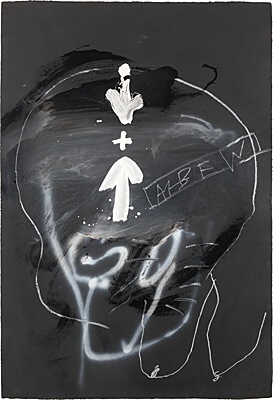 The first half was devoted to the final phase of the Franco regime, to Tàpiess years of protest and struggle, which he accompanied with a series of manifesto-like works; the second to the achievement of democracy, after forty years of dictatorship a protracted process. 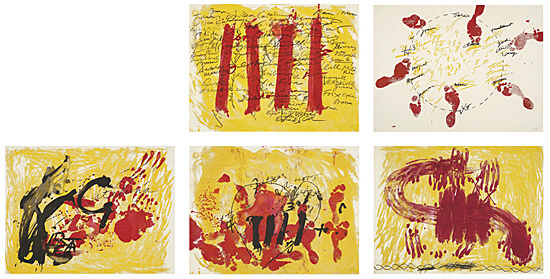 In his art, such politically motivated works of those years stand out for their legible inscriptions and a, for Tàpies, unusually vibrant colouration of red and yellow, the colours of both Spain and Catalonia. 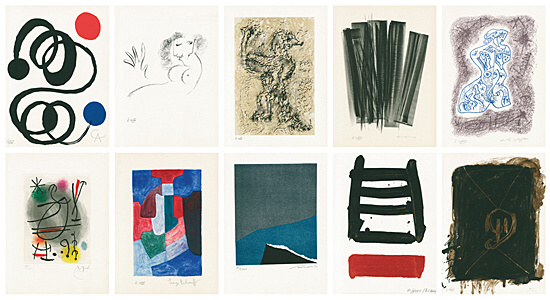 In these years, a series of prints, various portfolios and thematic series appeared. A great deal of contemporary history can be read in them. 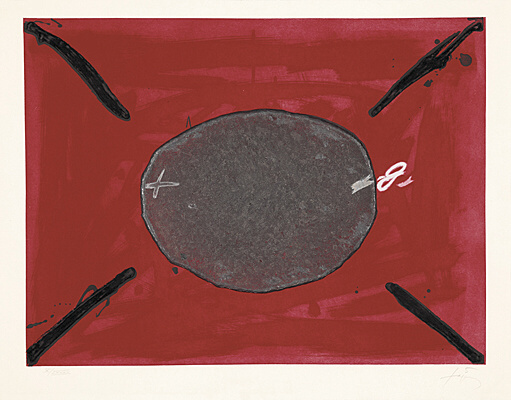 Highlights of Tàpiess oeuvre of prints are his portfolios and artists books. Each of these objects has its own character. They lead the viewer directly into the elementary experience of an art that places the sense of touch alongside that of sight. 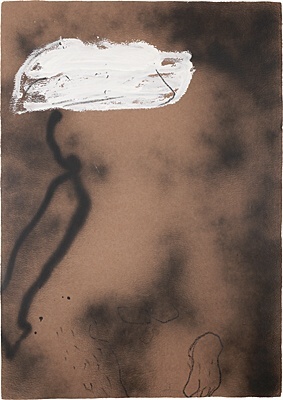 Unlike the large material paintings, they no longer convey themselves solely through the eyes and that which memory accomplishes, by adding the sense of touch. 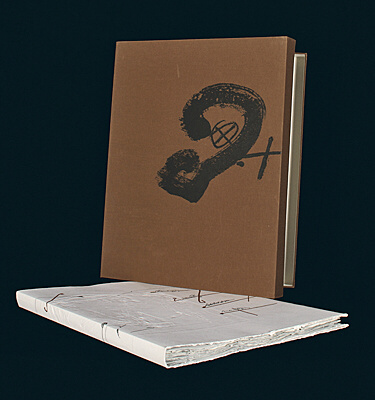 The portfolio works and artists books are literally placed in our hands. They thus enable us to be very close to the work, making the creative act comprehensible in all phases. No framing, no glass separates the viewer from the composition. The individual sheets lie in front of us. We turn them around, get to know them from two sides. 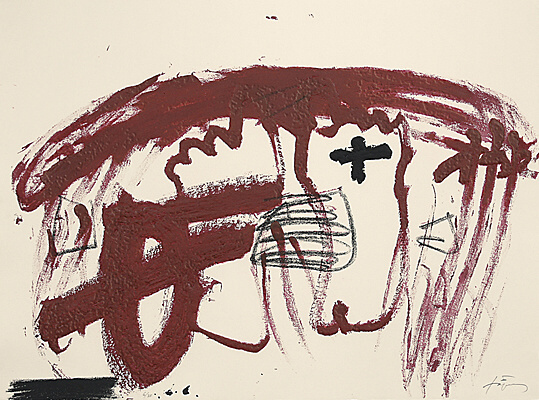 With Antoni Tàpies, this is always associated with a surprise. Like a coin, each sheet has two sides. This is due to the special papers and the various embossing techniques that give the print its striking relief character. Over the years, some of the colours have also penetrated the reverse sides. One does not perceive it as a shortcoming, but as a further trace of a living artistic process. 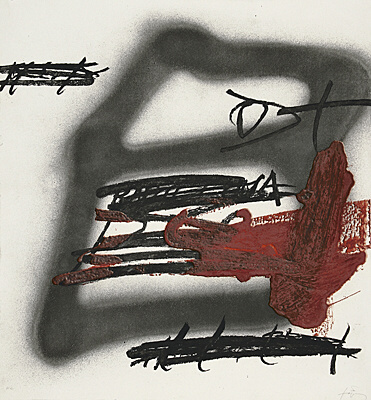 Excerpts from: Barbara Catoir, Wie eine Münze mit zwei Seiten, Beispiele des druckgrafischen Werks von Antoni Tàpies, in: Antoni Tàpies. 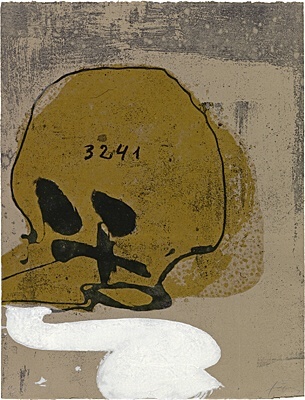 Malerei und Graphik, (Cologne: Galerie Boisserée 2011). 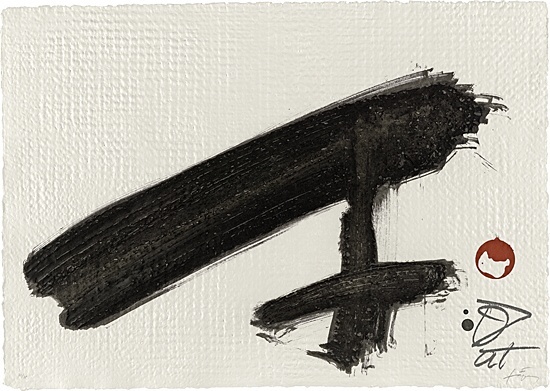 1923 Tàpies wird am 13.12. in Barcelona geboren. 1934 Erste Zeichen- und Malversuche. Durch Zeitschriften hat er den ersten Kontakt zur zeitgenössischen Kunst und Literatur. 1940 Zweijähriger Sanatoriumsaufenthalt aufgrund eines akuten Herz- und Lungenleidens. Er widmet sich der Literatur, Philosophie und Musik. Er zeichnet viel und kopiert Bilder von van Gogh und Picasso. 1943 Beginn eines Jura-Studiums an der Universität in Barcelona, das er 1946 wieder aufgibt. 1944 Besucht für zwei Monate die Kunstakademie "Nolase-Valls". 1945 Werke mit pastosem Farbauftrag und Materialcollagen mit Schnüren, Erde, Zeitungs- und Toilettenpapier. 1947 Erste Ausstellung beim "Oktobersalon in Barcelona". 1948 Gründet mit anderen jungen Malern und Schriftstellern die Zeitschrift "Dau al Set". Im Oktober- Salon in Barcelona stellt er erstmals zwei Bilder aus. Eine Collage mit Kreuzen aus Toilettenpapier erregt heftige Diskussionen. 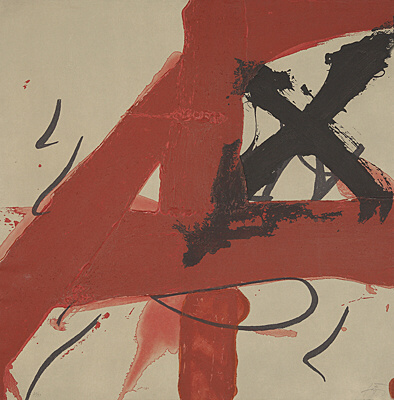 1949 Teilnahme an der Ausstellung "Un aspect de la peinture catalane" in Barcelona. Erste Radierungen. Seine Werke sind jetzt stark vom Surrealismus beeinflusst. 1950 Erste Einzelausstellung in Barcelona. Stipendium ermöglicht einen einjährigen Aufenthalt in Paris. 1952 Beteiligung an der XXVI. Biennale in Venedig. 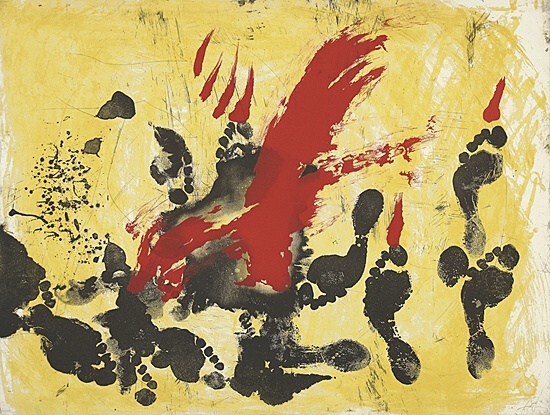 1953 Erste Ausstellung bei Martha Jackson in New York. Beteiligung an der Biennale von Sao Paulo, wo er einen Preis gewinnt. 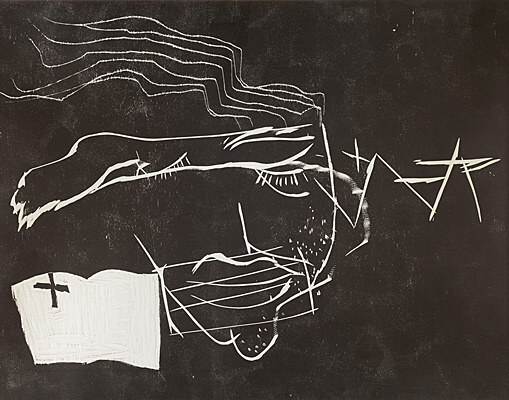 1954 Teilnahme an der Biennale in Venedig. Bekanntschaft mit Michel Tapié. 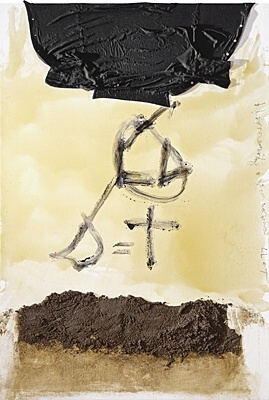 1958 Tàpies vertritt Spanien bei der Biennale in Venedig. 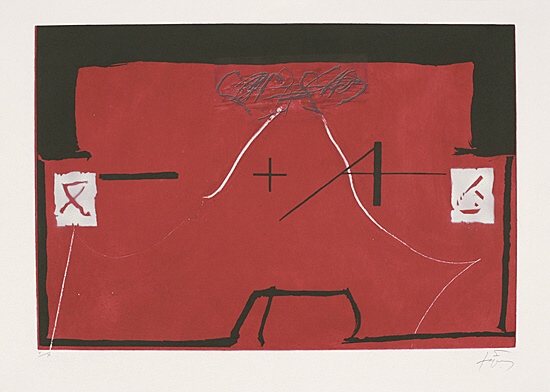 1960 Teilnahme an den Ausstellungen "New Spanish Painting and Sculpture" Museum of Modern Art , New York) und "Before Picasso-after Picasso" Guggenheim Museum, New York). 1962 Die Kestner-Gesellschaft, Hannover, zeigt die erste Retrospektive in Deutschland. 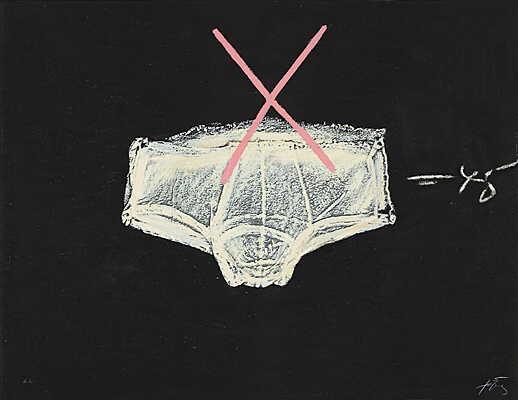 Ausstellung im Guggenheim Museum, New York. 1963 Umzug in die Calle Zaragoza, Barcelona, wo er bis heute lebt und arbeitet. 1964 Auf der documenta III ist er mit einem eigenen Raum vertreten. 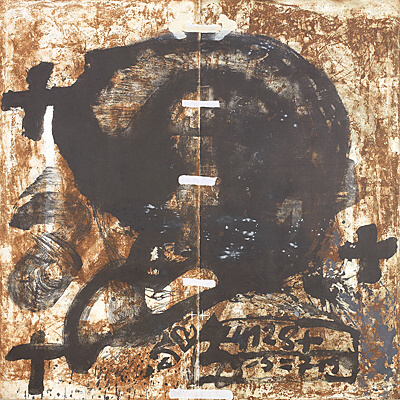 1966 Tàpies wird bei einer Versammlung von Antifrankisten verhaftet. 1968 Für die Fenster des Kapuzinerklosters in Sion entstehen mit Tusche bemalte Tücher als Vorhänge. 1970 Arbeit an einem großen Foyerbild für das Theater in St. Gallen. Im Dezember nimmt er mit Miró anlässlich eines Gerichtsverfahrens gegen baskische Nationalisten an einer Versammlung spanischer Intellektueller im Kloster Montserrat teil. 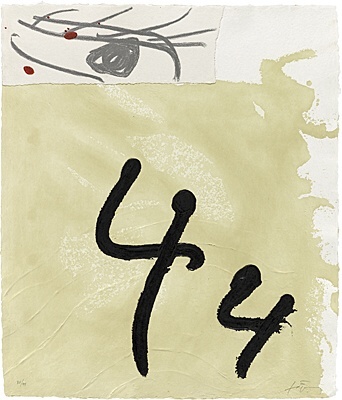 1973 Tàpies veröffentlicht in der Tageszeitung "La Vanguardia" eine Serie von Artikeln, die später in Buchform erscheinen. 1974 In Barcelona wird der junge spanische Oppositionelle Salvador Puig Antich hingerichtet. 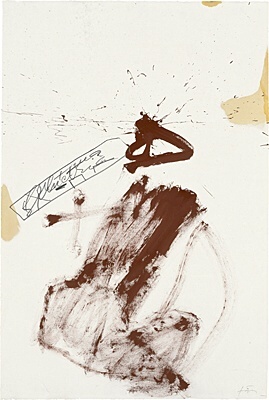 Tàpies schafft daraufhin eine Serie von Monotypien mit dem Titel "Mörder". 1979 Ernennung zum Mitglied der Berliner Akademie der Künste. 1981 In Saint-Paul-de-Vence entstehen unter der Anleitung des Töpfers Hans Spinner die ersten Skulpturen aus gebranntem Ton (Schamotte). 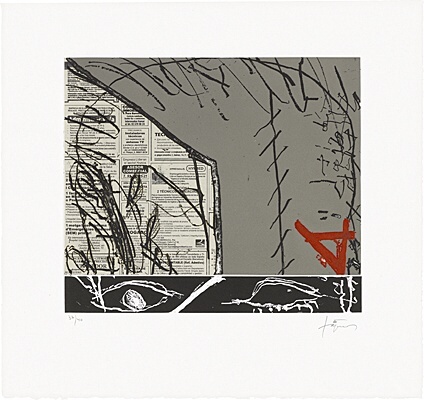 1983 Einweihung des Monuments für Picasso in Barcelona. 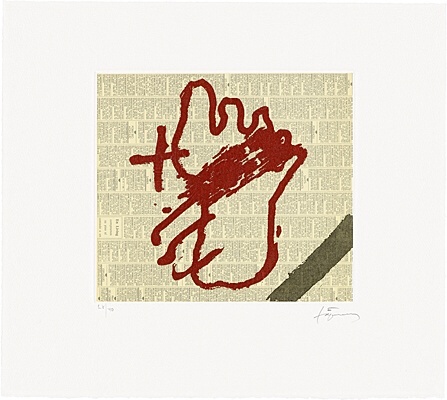 1987 Gründung der "Fundacio Antoni Tàpies" in Barcelona. 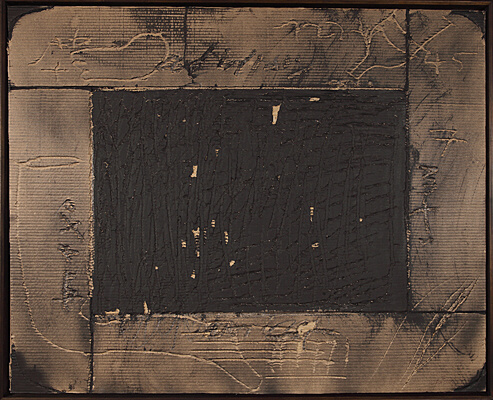 1988 Retrospektive im Musée Cantini, Marseille. 1989 Retrospektive des graphischen Werks in Peking. 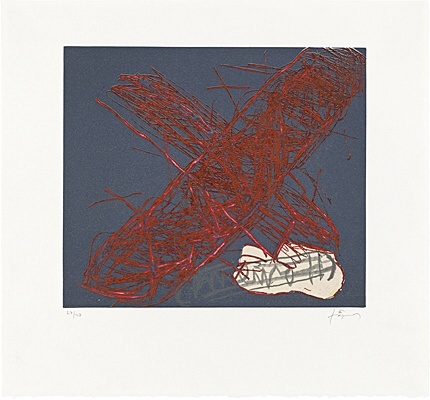 1990 Eröffnung der "Fundacio Antoni Tàpies" in Barcelona. 1992 Es entstehen zwei große Wandarbeiten für den katalanischen Pavillon und den des Internationalen Olympischen Komitees auf der Weltausstellung in Sevilla. 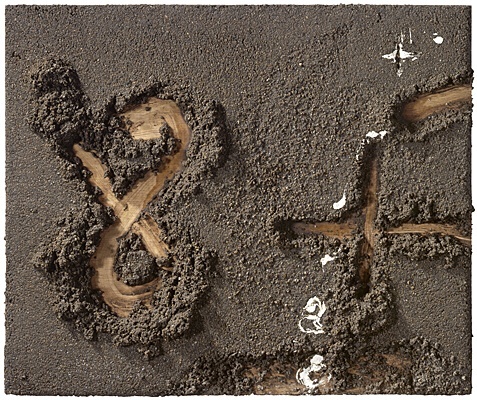 1993 Im Spanischen Pavillon auf der Biennale von Venedig wird sein "Environment Rinzen" (Plötzliches Erwachen) gezeigt und mit dem Goldenen Löwen ausgezeichnet. 1997 Nimmt mit einem Vortrag zum Thema "L’art entre la despotisme et l’anarchie" an einem Forum der Académie Universelle des Cultures (Paris) zur Frage der Intoleranz teil. Retrospective im Museo Precci, Prato. 2000 Retrospektive im Museo Nacional Centro Sofia, Madrid, anschließend im Haus der Kunst, München. 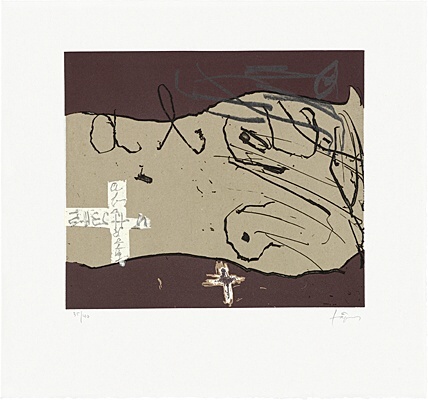 2001 Ausstellung "Antoni Tàpies ou la Poétique de la matière" mit Graphiken und Illustrierten Büchern in der Bibliothèque Nationale de France, Paris. 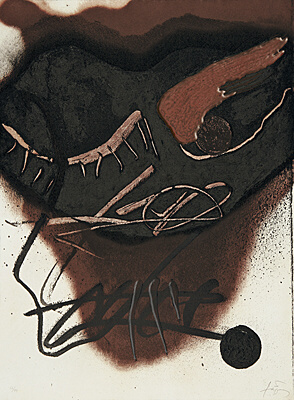 2002 Retrospektive der Illustrierten Bücher in der Fundació Antoni Tàpies, Barcelona. 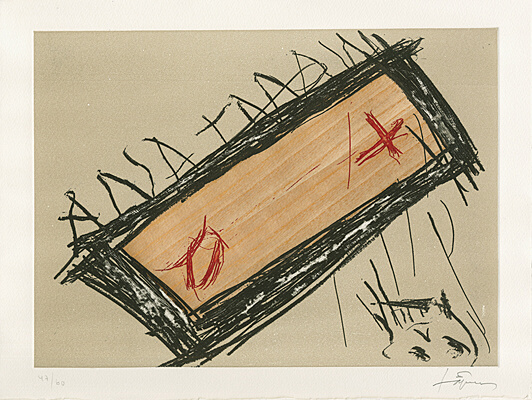 2003 Thematische Wanderausstellung "Antoni Tàpies. 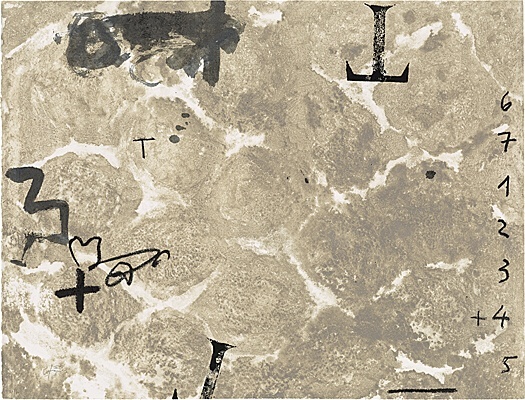 Cos i llenguatge" (Körper und Sprache), organisiert von der Fundació Antoni Tàpies. 2004 Retrospektive im Museu d’Art Contemporani de Barcelona (MACBA). 2005 Retrospektive im Hara Museum in Tokyo. Einzelausstellungen in London und Zürich. 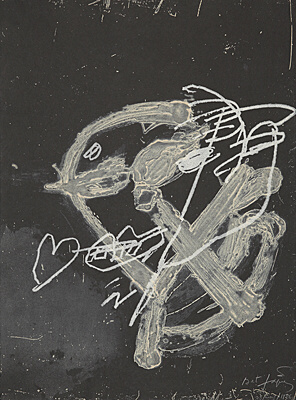 2006 Einzelausstellungen in Paris, Madrid, Barcelona, Porto, Lissabon, London, New York und Toulon. 2007 Retrospektive im EMMA-Espo Museum of Modern Art, Finnland und Einzelausstellungen in Madrid, Valencia. 2008 Retrospektive in Toulouse, Prag, Berlin und Einzelausstellungen in Barcelona, London und Zürich. 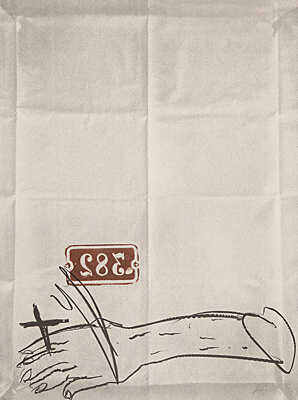 Zum 85. 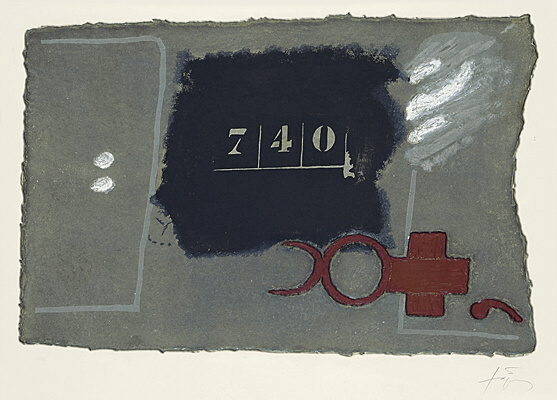 Geburtstag erscheinen das Mappenwerk "Tàpies escriu" (Tàpies schreibt) mit ausgewählten Texten von Antoni Tàpies und druckgraphischen Arbeiten verschiedener Künstler und zahlreiche Publikationen. 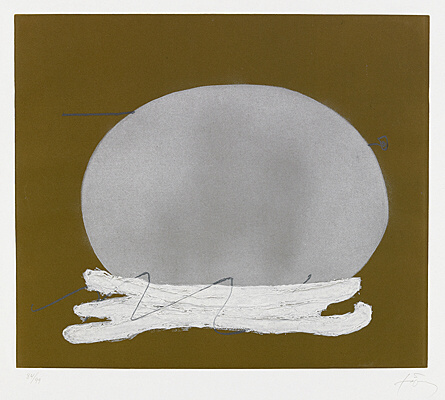 2009 Einzelausstellungen in New York und Catanzaro. 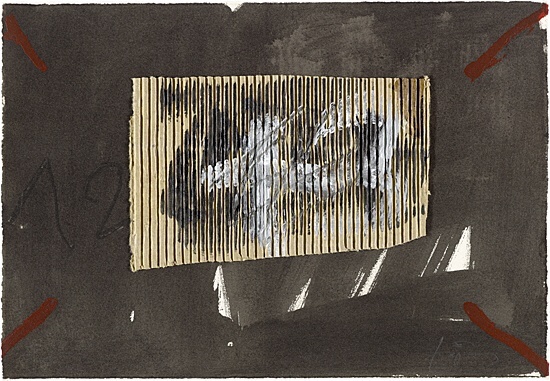 2012 Tàpies stirbt am 6. Februar in Barcelona. 1958 Erster Preis des Carnegie Instituts, Pittsburgh. 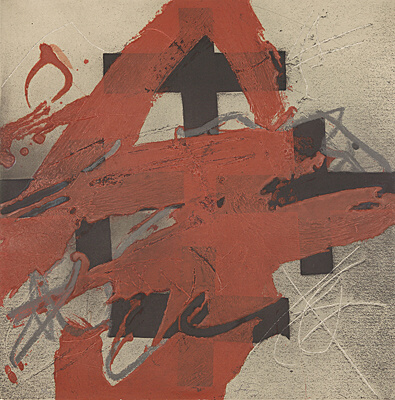 1960 Preis der Internationalen Biennale für Grafik in Tokio. 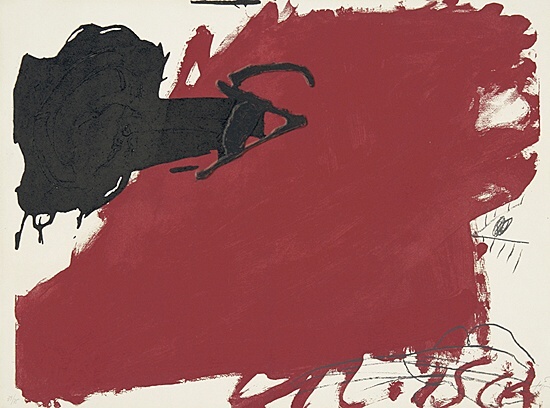 1964 Preis der Guggenheim Foundation, New York. 1966 Großer Preis der VI. Biennale di Mentone. 1967 Großer Preis der Grafik-Biennale Ljubljana. 1972 Rubens-Preis der Stadt Siegen. 1974 Erhält die Stephan-Lochner-Medaille der Stadt Köln. 1979 Literaturpreis der Stadt Barcelona für seine Autobiographie. 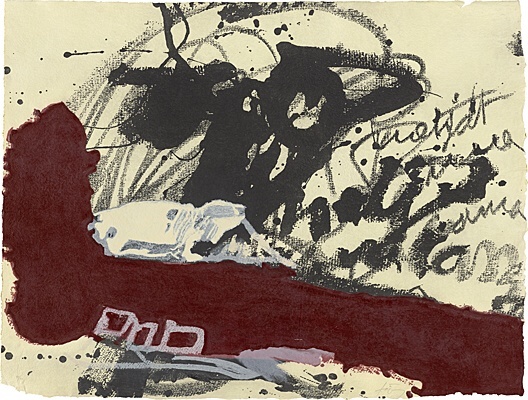 1982 Preis der Stiftung Wolf, Jerusalem (zusammen mit Chagall). 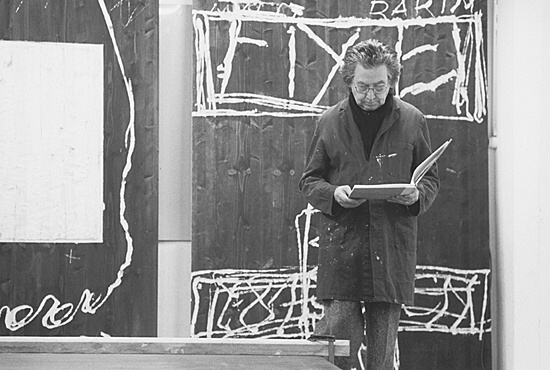 1983 Rembrandt-Preis der Stiftung M.Töpfer, Hamburg. 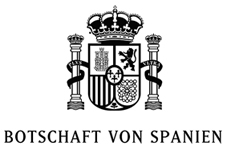 1984 Friedenspreis der spanischen Gesellschaft für die Vereinten Nationen. 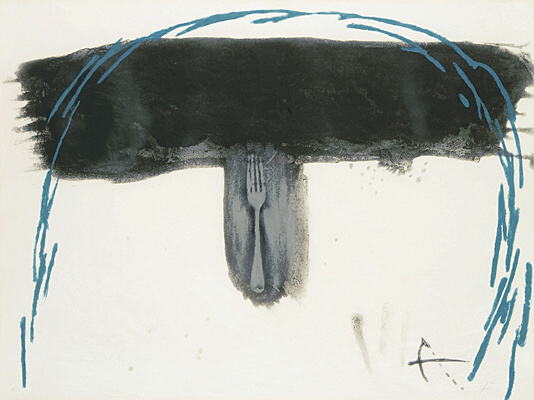 1985 "Prix international de peinture" der französischen Regierung. Ernennung zum Mitglied der Königlichen Akademie der Schönen Künste in Schweden. 1988 Ehrendoktorwürde der Universität von Barcelona. "Commendeur de l’Ordre des Arts et des Lettres" der französischen Regierung. Ehrenmitglied der Gesellschaft Bildender Künstler österreichs. 1990 Ehrendoktor der Universitäten von Glasgow und den Balearen. 1991 "Premio Tomás Francisco Prieto” der Fundación Cultural Casas de la Moneda. 1992 Ehrenmitglied der Royal Academy of Arts, London und der amerikanischen Academy of Arts and Sciences, Cambridge, Mass. 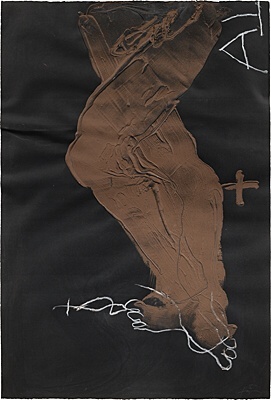 1996 Kreuz des Santiago-Ordens der portugiesischen Regierung. 1998 Ehrendoktor der Budapester Akademie der Schönen Künste. 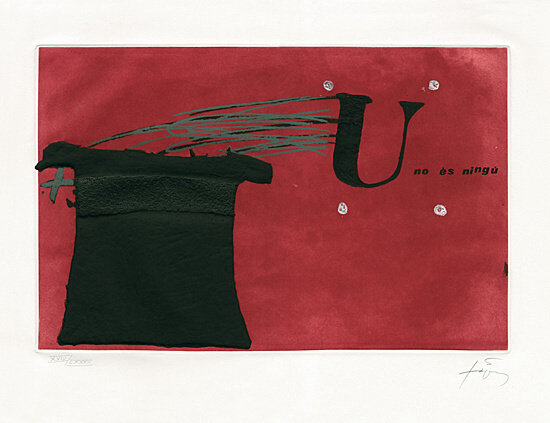 2002 "Premio Nacional de Grabado y Arte Grafico" der Calcografia Nacional und der Real Academia de Bellas Artes de San Fernando, Madrid. 2003 "Premio Velázquez de las Artes Plásticas" des spanischen Ministerio de Educación y Cultura. 2005 Erhält den italienischen Lissone Preis für sein Gesamtwerk. 2010 Verleihung des Adelstitels "Marquis" durch den spanischen König Juan Carlos I. Auszeichnung durch die 5. Internationale Graphik Biennale Douro, Portugal.